The bereaved father of Ruth Fogel, one of the victims of the Itamar massacre, teaches a lesson of faith and strengthens the People of Israel. In a radio interview on radio Monday, Rabbi Yehuda Ben-Yishai, the mourning father of Ruth Fogel, one of the five victims of the Itamar massacre, taught a lesson of faith and strengthened the People of Israel. His inspiring remarks on Voice of Israel government radio stunned the interviewer into near silence and brought tears to her eyes. After Rabbi Ben-Yishai expressed deep pain but no anger or calls for vengeance, interviewer Estie Perez, who has described herself as a secular Jew, asked, “Where do you have the strength and restraint that you can talk now and strengthen us, without anger and without calling for vengeance – that is not in your voice? Where is the strength from?" Rabbi Ben-Yishai answered, "I have worked in education many years, and as an educator, I try to strengthen and teach people faith. I understand that I cannot be satisfied with words and that I also must implement the same principles on which I have educated others. This is a test of my faith, and therefore I agreed to be interviewed." Rabbi Ben-Yishai said Monday morning that he asked the oldest surviving children, 12-year-old Tamar and eight-year-old Ro’i, if they wanted to say the Kaddish prayer, recited by mourners and expressing their faith in the Creator. He said, “We [the grandparents] will take upon ourselves the difficult task and pave for them the path so that life will be victorious." “Their mother and father will pray for them from the Heavens, their grandfathers and grandmothers will give them a lot of love, and the People of Israel will hug them and encourage them to grow and continue in the path of their parents." Rabbi Ben-Yishai revealed that the police came to his home on Shabbat to inform him of the attack but that no one was home because they were visiting in the north. “The Creator was kind to us” by his not having to bear the bad news on the holy Sabbath. “Our daughter called after Shabbat, assuming we already knew." Prime Minister Binyamin Netanyahu spoke with Rabbi Ben-Yishai on the telephone Saturday night and visited him Sunday morning. “He felt great sorrow and said that the entire People of Israel are part of the sorrow. 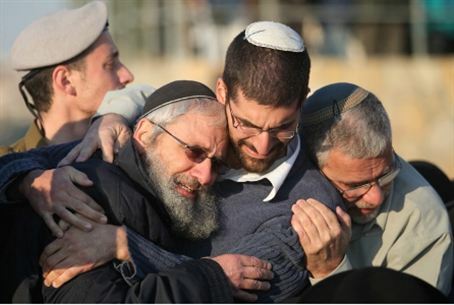 We hugged each other,” Rabbi Ben-Yishai said. In years past, Rabbi Ben-Yishai was a rabbi at Jerusalem's Machon Meir.